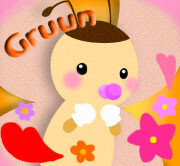 -------I would, by all means, like to take this opportunity of introducing to everyone -- a group by the name of "Gruun". To tell you the truth, I am one of the members of the group. If I summarize their activity in a nutshell, the task is simply to increase/send in a number of volunteers who would engage themselves in "dacco" (hugging/cuddling infants in warm arms) activity at infant-facilities (homes) where the care-giving staff members easily get very busy/occupied especially early in the evening. There is often the case that the true affectional bonds in mutual trust isn't easily established and/or stabilized between the children being brought up there and adults around them, thus the situation is said to be unchanged lasting for the rest of their lives. Gruun's idea is to mobilize the volunteers who are sent into the busiest time of the facilities(homes) while the staff members there go through the daily hustle and bustle in preparing meals and/or giving a bath for the infants. This not only helps the staff relieving their burden, but also the infants can nurture and keep the relationship with the adults around... without them being unattended. Existence of reliable adults is indispensable absolutely for the infancy in terms of their sound affectional formation. All the children need the existence of "someone" who would help to support in living out their "own lives". The volunteers do not only dacco, but also perform "baby massage", through which the bonds of the affection can be firmly establishded, and it is actually a part of their activities as well. Gruun does zero in on not only this dacco project, but it also envisages to aim at nurturing the future possibility that the dacco may create an opportunity for would-be foster-parents, i.e., by way of the touch and feel act between volunteers and children. By this, the affection of the volunteers toward the children may spur to help their volunteers' status becoming the real foster-parents. Meantime, it will take time for the social system to be transformed, and it also requires an exorbitant time and effort in doing so. Regrettably, the number of foster-parents hasn't increased for the past ten years. In this last decade, continually the child abuse cases have been increasingly reported. I hope to see this Gruun's activity expand more in the civil level creating eventually more power that could possibly shake administrative authorities as a big reformative whirlwind--------.